Cosmo Poll: Do You Like Katy Perry Outrageous Or Au Naturel? Katy Perry: Part of Me shows fans two sides of the California Gurl: the playful pop superstar and the bare-faced beauty. Which look do you dig on her? As part of our beauty month MO, we've been posting a spate of celebrity polls to find out your thoughts on the evolving looks of a few stars; namely, Anne Hathaway, Emma Stone, and Miley Cyrus. To round up our series of polls, we want to know what you think about Miss "California Gurl", Katy Perry. From the onset of her career, it has been clear that Katy is a fearless chick who likes to defy conventions and who knows how to have fun. She has worn her hair in every color of the rainbow, and only she could pull off a cupcake bra that has small sparklers shooting out of them. While her fans love her for her wacky fashion and beauty choices, they might just love the fresh-faced Katy even more. Katy's movie, Part Of Me--which is set to premiere this week--gives fans rare glimpses of the singer without her usual blue hair and sparkly regalia. The documentary concert film shows behind-the-scenes footage of Katy sans face paint and in gym clothes as she rehearses for her concert tour. Without her accompanying makeup and costumes, the pop superstar seems so...normal. She could be the epitome of the American girl next door--a far cry from the worldwide icon who gained fame in no small part due to her fluorescent hair and out-of-this-world outfits. 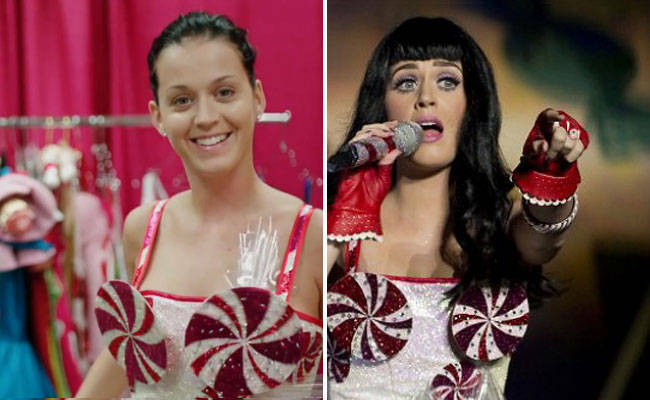 We want to know what you think: Do you like "California Gurl" Katy or Part of Me Katy--outrageous or au naturel? Vote now and sound off in the comments section below!